Toyota will go all in on sports this fall with a new brand campaign designed to unite its sports advertising from pro football to Nascar. The campaign kicks off with a new spot called "Anthem" from Saatchi & Saatchi, Los Angeles that will debut during the NFL's 2015 season-opening game Thursday night. "Anthem" will be the first of four new sports-focused brand commercials coming this fall. The campaign will likely culminate with an in-game spot during CBS' telecast of Super Bowl 50 on Feb. 7, 2016. Jack Hollis, group vp of marketing for Toyota Motor Sales USA, gave Adweek an exclusive preview of the 45-second spot slated to debut during the Toyota-sponsored halftime show of NBC Sports' telecast of tonight's game between the defending Super Bowl champion New England Patriots and the Pittsburgh Steelers. The ad shows players and fans going the extra mile for the teams they love. 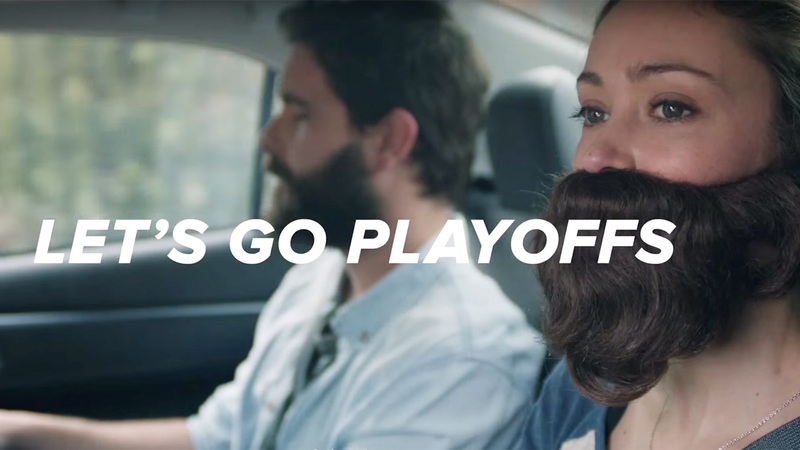 We see a group of fans driving to a game wearing their lucky playoff beards—including one young woman who wears a fake one. "Let's go playoffs," says the spot. We see another vignette of fired-up football players stopping to ritually slap one player's ample gut before charging onto the field. "Let's go superstitions," adds the spot. The copy plays off the automaker's longtime tagline, "Toyota. Let's Go Places." Hollis played on the 1988 Stanford University Cardinal team that won the NCAA baseball championship and was drafted by the Cincinnati Reds, so he knows about the passion generated by sports. "At Toyota, we certainly understand what it means to be a passionate sports fan," he said in a statement. "In the 'Anthem' spot that is kicking off the campaign, we aim to reach the die-hard fan, the one who always gathers with friends to share their passion for the big game, week after week." The campaign will be all about the "rush" fans get when they go the extra mile, according to Jason Schragger, chief creative officer for Saatchi & Saatchi, LA. "Toyota wants to capture the excitement of the 'Let's Go Places' attitude by highlighting those passionate moments and unlocking the life explorer in everyone," he said. The campaign will feature the Toyota Camry sedan, America's best-selling car for 13 straight years, as well as the Corolla subcompact and Tacoma pickup truck. The strategy is to create "a truly unified voice for Toyota in sports," Hollis said. But the automaker declined to say whether it's buying time on Super Bowl 50. Toyota has advertised in and around the NFL for years. It sponsors the "Toyota Halftime Report" on NBC's Sunday Night Football. It also sponsors ESPN's Monday Night Football. But Toyota has to worry about a new competitor in the NFL space. Hyundai recently signed a multiyear deal as the league's official automotive sponsor, replacing General Motors. Hollis declined to comment on whether Toyota kicked the tires on the league-wide NFL sponsorship, saying the carmaker is "constantly evaluating" opportunities. In an otherwise dreary world, consumers keep coming back to sports programming because they know at any moment they might get to witness a real-life fairy tale come true, said marketing guru Ernest Lupinacci, CEO of Ernest Industries. Call it a natural morality play. "A sporting contest has a beginning, middle and end," Lupinacci said. "Over the course of the game, we recognize certain paradigms—the good guys, the bad guys, the heroes, the goats."